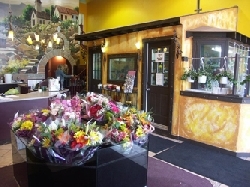 We are an experienced locally owned and operated florist. Heather Kerr is an AIFD certified floral designer with years of experience in the industry.We offer great gift options for any occasion. Send flowers by the bunch or send exquisite one of a kind custom arrangements. Enjoy the convenience of safe and secure ordering online 24 hours a day. The service was great, the flowers were beautiful, great price, you made our daughter very happy, will def use this service again. Thank you so much for helping me find an amazing florist to send some beautiful flowers to my friend on the other side of the wrold!!! Recipient (my mother) says the flower display is perfect and just what she would have chosen. Easy to order. Thank you so much. Efficient service and reasonably priced products. It is always good to shop locally. Delivery was on time and recipient was very pleased with the arrangement,saying it was 'GORGEOUS'. Thank you. High contrast. A happy arrangement with gerberas and yellow parrot tulips in a ceramic vase container. Lemon lilies and yellow and lemon mix in a powder blue ceramic pot. A beautiful array of white tulips and lilac flowers arranged in a toning container suitable for any occasion. For that special occasion with a lemon and purple theme contained in a classic green pot. 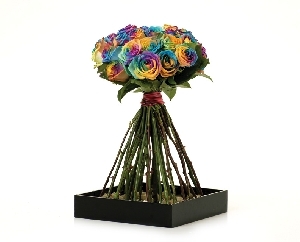 24 Long stem rainbow colored roses tied beautifully together in a stand up arrangement. 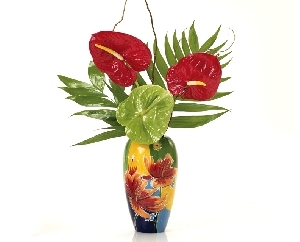 Anthuriums and greens arranged in a decorative vase. 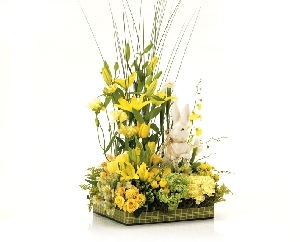 A spectacular display of yellow tone spring flowers, including lily's and roses. A Round arrangement of hydrangeas mixed with roses, gerber daisies and carnations. 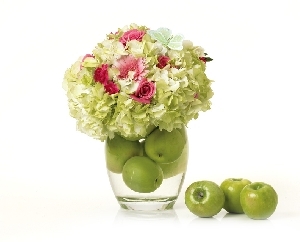 Arranged in a clear vase filled with apples. Great for any occasion. 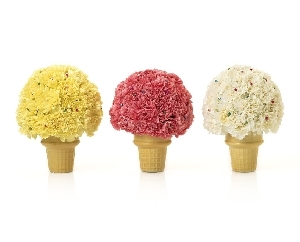 A splendid display of carnations arranged to look like an Ice Cream Cone. Price listed is Per Ice cream Cone Arrangement. Perfect for any birthday. 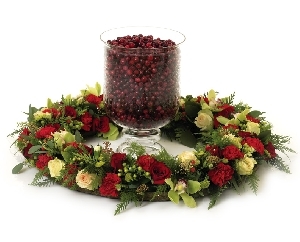 A holiday wreath filled with fresh flowers and greens centred by festive berries. 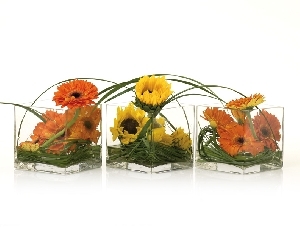 A unique display of gerber daisies and sun flowers placed in a cubic vase. Price is Per Vased Arrangement.